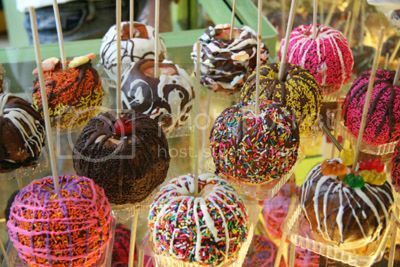 Fall is approaching and a great thing to do with the over abundance of apples that we're seeing is make taffy apples! Wash and completely dry the apples. Insert a stick into the stem end of each. Fit a heavy-bottomed saucepan with a candy thermometer. Over high heat, cook 3/4 cup of the cream, the corn syrup, butter, and sugar to 246 degrees F (firm ball); at this point the syrup will be golden. Remove from the heat and carefully swirl in the remaining 1/4 cup of cream and the vanilla. Use caution; this is very hot and it may splatter. While the caramel is hot, dip and turn the apples into the caramel to coat and let the excess drip off. Dip the bottoms into the chopped nuts. Arrange the apples on a nonstick or waxed paper-lined cookie sheet and let cool. You can also add any goodies to them that you want to make them extra Tasty! Hair styles and hair colors change with the weather and fall 2014 is time for a change. Have you seen some nice do's or are folks running around looking more like your Aunty on acid? This is supposed to be a hot fall look but instead it looks like she just woke up and her hair could use a wash.
Share your favorite looks, good or bad! It's getting chilly and rainy this month around the world and it's leaving us stuck indoors. What are some things we can do to entertain ourselves? I thought about maybe having an indoor treasure hunt, nah. Maybe taking a bubble bath, nah. I could bake some cookies but then I remembered that I don't bake. You can definitely play Bingo in the Sun but what is there to do when it's raining? Ok so there is plenty of tips out there to help you from overeating this Thanksgiving. I say it is what Thanksgiving is all about and there should be NO rules as far as what you put in your mouth......well almost anything you put in your mouth! I started out with creating a list of how not to go overboard with eating and thought hey who am i kidding i can't give advice i won't follow! 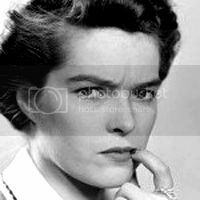 However if you do overeat and feel a bit sicky have plenty of Pepto-Bismol, Alka-Seltzer Tagamet! I woke up to the sun shining so brightly in the UK and thought I slept through to spring. There are currently 31 more days until we get there. Spring begins on March 20th this year. I love tulips and I'm always looking for a way to make them last longer once they've been cut. Start with a very clean vase. Fill it about 1/3 full with fresh, room-temperature water; tulips last longer in shallow water. Add cut-flower food to the vase. You can also nourish flowers with a solution of one teaspoon sugar and two drops liquid bleach per gallon of fresh water. Hold each stem next to your vase to gauge how much you'll need to trim. Using a sharp knife, cut stems at a 45-degree angle so they won't sit flat in the vase. Cut away any white stem tissue for better water absorption. Remove any leaves under the water line to prevent rotting. Recondition your tulips daily: Recut the stems, change the water, and add nourishment. Keep in a cool area; heat reduces bloom time. If tulips droop once arranged, try this: Insert a pin through the stem just below the head; then pull it out. The holes let air escape to expedite the water flow. Keep in a cool place for longest life. Don't you just feel like tiptoeing through the tulips with me? What is your favorite Glorious spring flower? Without sounding trite i am right with you tulips are my favorite. I remember the first year i planted them around the side of my house. They had to be planted in the fall and i waited anxiously in the spring for them to pop up but they never did! Did a bit of research and discovered i planted the bulbs upside down . Winged eyeliner can be tricky. Ladies there is a fool proof way to get the perfect cat eye. And if you're a guy that likes to rock some eyeliner pay attention to achieve a sharp Bingo Liner. "Place a piece of Scotch tape (about 1″) along the outer part of your eye toward the tail of your eyebrow, using your lower lash line as a guide. Take your bent eyeliner brush (or any super small makeup brush) and apply your eyeliner along the tape, connecting it to your upper lash line to form a triangle shape—this will give the illusion of a wing." Source: One Minute Winged Liner plus a video is available from Makeup Geek. Love those cat eyes soooooo kewl! Summertime BBQ's and the Appetizers are Easy! With warm weather comes the fantastic outdoor cookouts (commonly called in the midwest) or BBQ's (called by everyone)! With every passing warm weather season there is always a new recipe we would love to discover. I came a cross a cool treat that is yummy, refreshing and also has a great presentation for a nice conversation starter. Cut fruit favorites - Strawberries, blueberries, blackberries, red raspberries, pineapple, grapes, kiwi and whatever other fruit favorite you have. Soften cream cheese and fold in in full jar of the marshmallow cream and place in center of party tray. 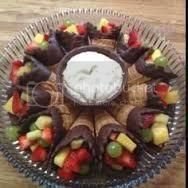 Fill waffle cones with fruit mix and assemble on tray and bon appetite! Now that summer is in full swing many of us are out getting lots of sun and sunburn is always a possibility. There are several home remedies that can soothe the burn. Rub some yogurt all over yourself, hang a couple of tea bags from your ears and have a winning day at Sun Bingo! The First day of Fall was September 23rd and it is time to prepare for the cool weather and colder months ahead! 1. Pull your winter linens out of storage including sheets and bed spreads and exchange for the light weight linens. 2. Get the vacuum attachment out and brush ceilings, walls and baseboards. 3. Get all photos and favorite memories of the summer organized and put into albums. 4. Wash windows and screens. 5. Replace any screens that have tears and broken windows. 6. Put summer clothes in storage and bring out winter clothing. 7. Update your window treatments with heavier currents to keep out cold drafts. 8. Winterize your outside garden and protect rose bushes and perennials through harsh winters for healthy spring growth. 9. Rake leaves regularly and shred to place in compost pile. 10. Clean chimney and furnace for quality performance. Then head for the Bingo House and share your Fall tips with roomies! Forget the beauty and let's talk about the beasts. Halloween is coming up and I was wondering if anyone has any parties coming up and please share some cool costume ideas. 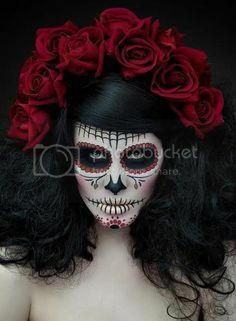 I've got a party happening on Halloween and I plan on painting my face like a day of the dead skull. I may even have time to play a spooky game of bingo at Vampire Bingo!